Dusty Wissmath grew up in Missouri, started fly fishing at age eight, and spent his formative years highly distracted by the sport. He began guiding and teaching fly-fishing in the early seventies while working on a degree in Wildlife Biology at the University of Wyoming. Living in Jackson, WY after graduate school he tied commercially for High Country Flies and guided on the Snake, Green and New Fork Rivers and in Yellowstone National Park. Dusty Wissmath, a Federation of Fly Fishers Certified Casting Instructor, will explore the fundamentals of casting that are so important to catching more fish. Are you struggling with a castitng problem? Here's your chance to ask a question of one of the best casting instructors around. After working as a Biologist in Wyoming and East Africa, Dusty started his fly-fishing school and guide service in 1995. He also served as the lead instructor at the L.L. Bean Fly Fishing School in Virginia and still teaches at the Wulff School of Fly Fishing in New York. 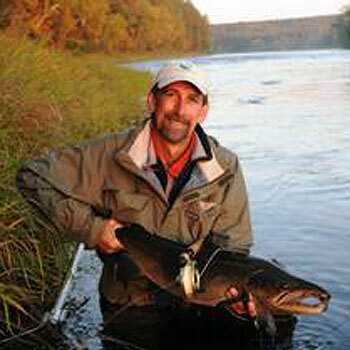 He is a Federation of Fly Fishers Certified Casting Instructor and is a member of the Board of Governors of the F.F.F. Guides Association. When he’s not teaching or guiding, Dusty gives casting demonstrations and workshops at sports shows from Montana to Virginia. His articles and photographs can be found in several outdoor magazines. Dusty is on the Pro Staff of the Scott Fly Rod Co., Ross Reels, & Hyde Drift Boats and is a fly designer for Brookside Flies of Denver, Colorado. Dusty says, "I've been lucky enough to work with and learn from some of the best in the business. Jay Buchner, Bob Clouser, Dave Whitlock and Scott Sanchez inspired me with their innovative and masterful approach to fly tying as well as effectively fishing the flies that they tie. From Paul Bruun, of Jackson, Wyoming I learned how to guide professionally and have fun doing it. Joan Wulff, Lefty Kreh, Macauley Lord and Floyd Franke taught me how to teach and how to analyze the cast. It's because of these folks that I am able to say I have the best job in the world. I’m privileged to call them my friends. I hope that I can open the door for you, as they did for me, to this fantastic sport."